Taking your children to an art museum can be frustrating: it can involve hot children, tired feet, a harried parent, and a fair amount of squabbling. But it can also—even on the same trip—involve a few moments of magic. For me, those moments have come when we have paused in front of one piece of art and taken out pencil and paper. For at least a few seconds, we are absorbed in looking. It is possible, these days, to view the artwork in advance and discuss it, or even to download or create fun activities to go with your museum trip. But if you don’t, a pencil and a journal (or paper) will be fine. 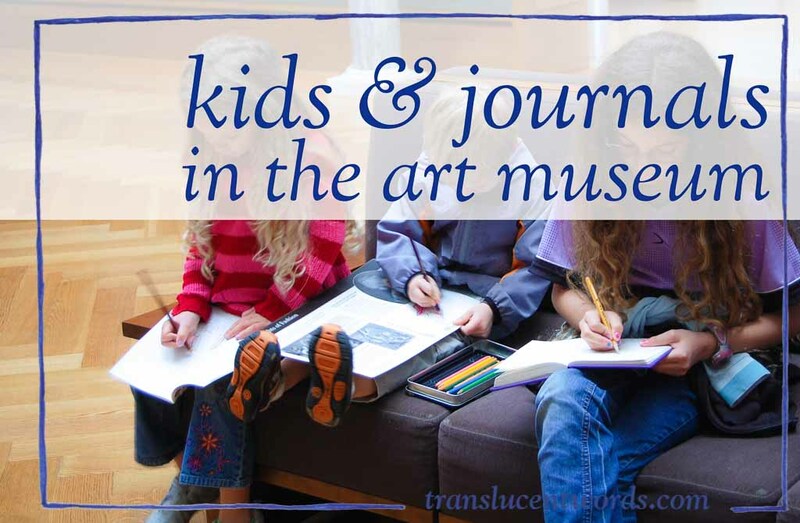 I was once in a museum with my two girls—about 9 and 4 years old then—settling down to draw in our journals, feeling a little bad because we were all tired and had no good plan. A mob of teenagers rushed into the room. My girls watched in awe as these teens, clutching their paper scavenger hunt guides, called out to each other when they identified the hidden “clue” in some painting, and then roared on into the next room. They were having fun, they were learning, but they weren’t exactly “looking” like we were. I suddenly felt much better about our simple approach. Just remember to look. Aim for a few moments of really connecting with one piece of art…anything else is gravy. Dragging everyone past every piece of art is not useful. Trying to enforce a long period of drawing or writing is not useful. Take as your goal just a few moments of engagement—that is the magic. 4. You do it, too! Quite a few times, I have decided I was too tired or too busy with other Mom-tasks to actually journal along with my girls. It has always been a mistake. You are not just a teacher, you are a “culture-maker.” And what you do, your children will (eventually) do—in their own way. In the long-term perspective, it is probably much more crucial for their education that you journal that day than that they do. You are investing in their whole life as a learner…and you will probably enjoy yourself more, too! That’s great! I’m so glad you liked it.